I don’t know what we got hit with in this house, but if it wasn’t the H1N1 flu, I have no desire to see what it is like. We have gone through more medication in this house in the past week, it isn’t even funny. On Monday I started to keep a log of all the medications that myself, Jon & Hannah were taking. I couldn’t keep track. I now have 4-5 pages full – not kidding. Good news is that the kids only missed 2 days of school (so far). Jon’s cough is gone (interesting considering he is the one with asthma). Hannah and I both still have a nasty cough, though I think she is feeling better overall than I am. I may have set myself back running a half marathon last week, but you know, you gotta do what you gotta do. I think that I am on the mend now, but it is slow going. So the first obstacle that I came to was – what is gluten-free that will help this nasty virus? I consulted my handy list and found I could take Mucinex & I know Delsym is gluten-free as I have called them to verify it. Sudafed PE (and it’s Walmart generic are gluten-free). Hall’s cough drops are also gluten-free. 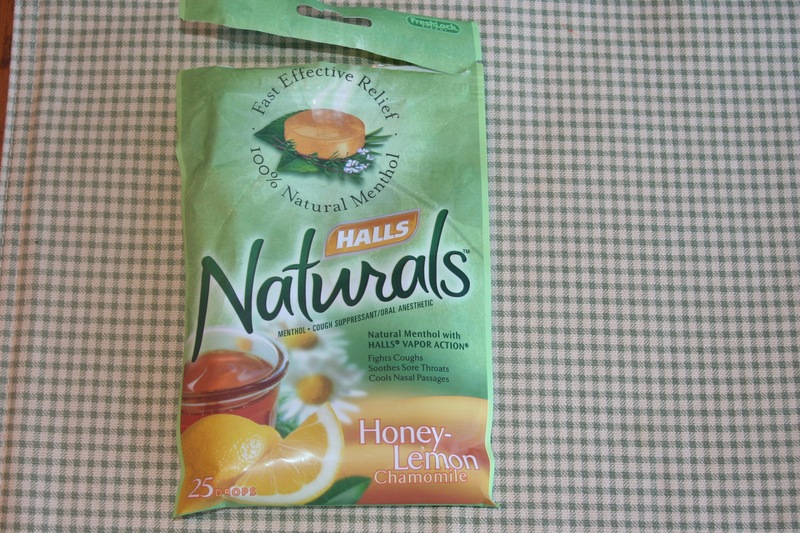 I chose the Hall’s Natural Cough Drops (Honey Lemon Chamomile) as they have the least number of ingredients & no artificial sweeteners. The most important thing, even above & beyond the gluten factor is to make sure that you are not overdosing by taking 2 different medicines that contain the same medication. If you are unsure, always ask a pharmacist. Some of the multi-symptom medications on the market not only contain a decongestant & cough suppressant, but a pain killer, too. Also, check to make sure that any other medications that you take on a day-to-day basis are compatible with the cold/cough medications. I found out that one of my medications can have possible interactions with Delsym (dextromethorphan). Good thing I asked. Hope you all stay healthy! Wash those hands!